Look no further — the Black Ink Pro Kit is the ultimate toolkit for comic artists, cartoonists, or anyone who likes to work in black line. 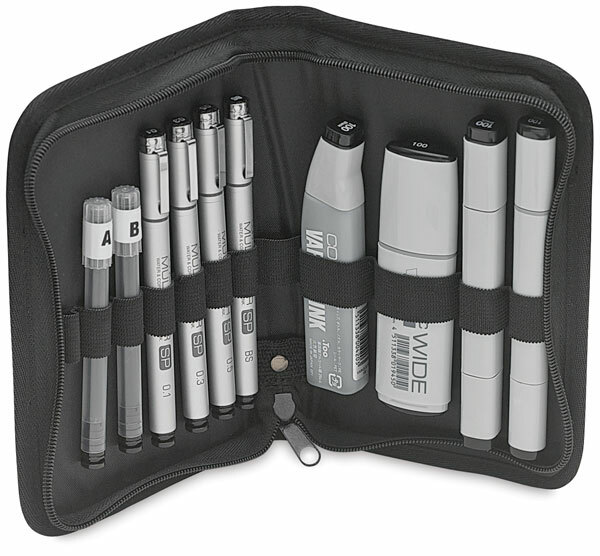 The kit holds one each Original Copic Marker, Sketch Marker and Wide Marker, four multiliner SPs (0.1, 0.3, 0.5, and brush), two SP refill cartridges, and a black Various Ink refill. The zippered, black, book-style case holds everything securely in place, with an extra slot for your own pen or pencil.